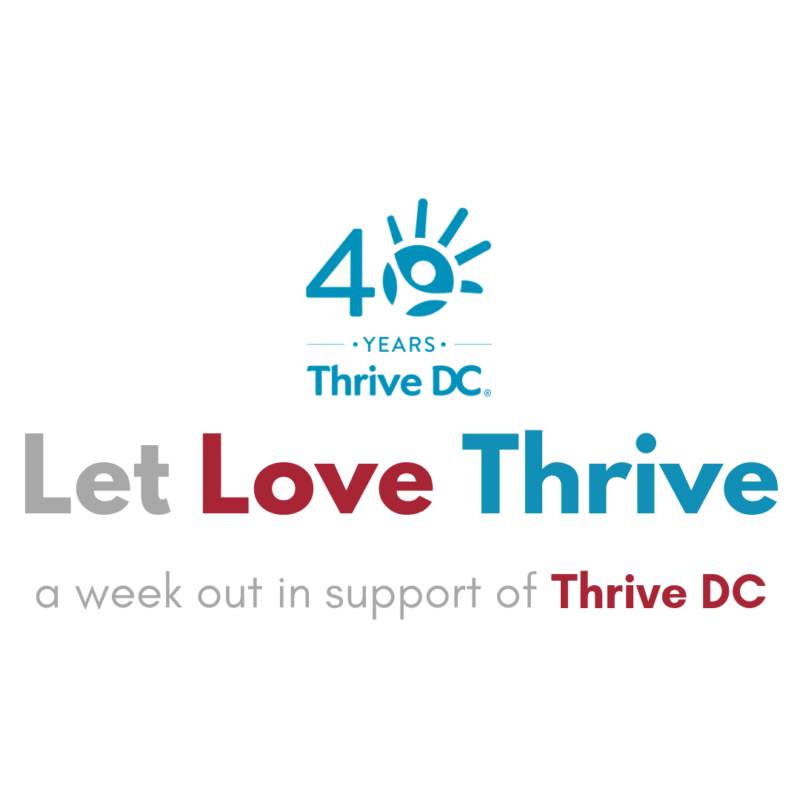 Thrive DC invites you to Let Love Thrive by joining in on a week of fun, food, and great service. Throughout the week of February 4th-10th, local DC businesses, restaurants, event spaces, and other organizations will be donating some portion of their proceeds to Thrive DC. All you have to do is dine out, use a service, or join up for an event and you will be helping DC’s most vulnerable residents. Participating in Let Love Thrive is simple! Spread the word on email, social media, and in person! The more the merrier. Take a picture and tag us on social media! Use #letlovethrive and #thrivedc so we can find you! For 40 years, Thrive DC has been working to end and prevent homelessness for D.C. residents. Headquartered in Columbia Heights, Thrive DC welcomes over 2,200 clients each year for emergency services like food, laundry, and showers, individual case management, workforce development, and more in order to build a path towards stability and success. From Wednesday, February 6th through Sunday, February 10th ANXO Cidery and Pinxtos bar will be donating $2 from every cup of hot cider to Thrive DC. Bhakti Yoga DC will be donating 40% of the profits from their drop-in classes next Monday, February 4th through Sunday, February 10th to Thrive DC! 50% of the proceeds from select wine flights will be donated to Thrive DC! Buy One, Give One: you buy one during our BOGO happy hour, and you donate your get one to Thrive DC. Exiles Bar will be donating a portion of their happy hour proceeds to Thrive DC on Tuesday, February 5th and Saturday, February 9th! 5th graders from Janney Elementary will be selling their original artwork to support Tour clients at their annual art show. Stop by Janney on Saturday, February 9th to support Thrive DC. Recharg will both be donating 5% of their proceeds on February 4th, 20 yoga mats, and a free community class to Thrive DC clients. Seoul Food will be donating 20% of their sales to Thrive DC on Thursday, February 7th. Stop in for lunch or dinner and enjoy some Asian fusion goodness! The Taproom at Union Stage is donating 20% of sales from their happy hour on Saturday, February 9th to Thrive DC! Swing by the Wharf for a slice of gourmet pizza on Saturday, February 9th! Union Pie will be donating 20% of their proceeds on Saturday to Thrive DC.